Sometimes it’s nice to have a fish supper that’s a little different to the usual baked, fried, or roasted fish fillet but coming up with new and innovative ways to prepare fish is challenging. I’ve realised however that there are a myriad of classic fish recipes I’ve yet to explore that fit this bill perfectly, and you can’t get more classic than traditional fish cakes. 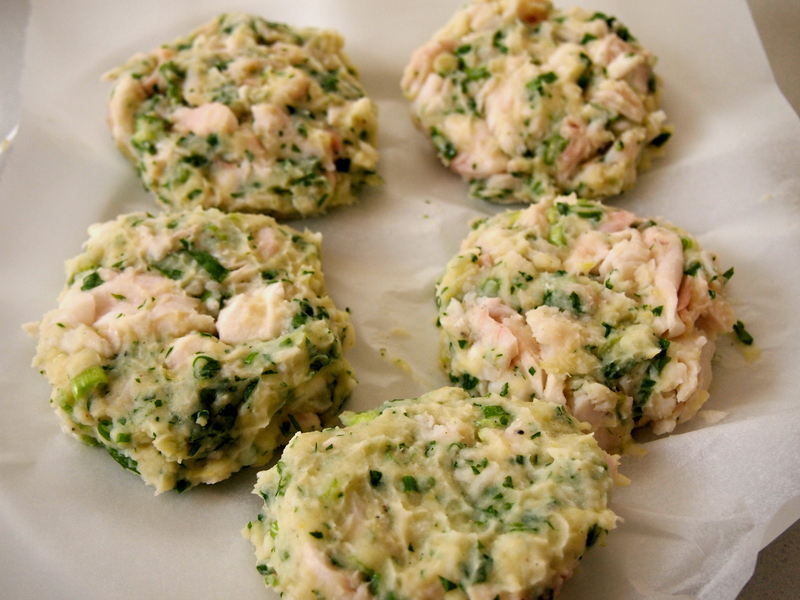 They’ve been around for years in various forms and most countries seem to have their own version but the classic fish cake consisting of white fish and potato is, I believe, an English creation with Mrs Beeton publishing a recipe in her 19th century Book of Household Management. There’s something so comforting about thick cakes of potato bound fish covered in a light crispy coating; the simple nature of the ingredients making it satisfyingly familiar. 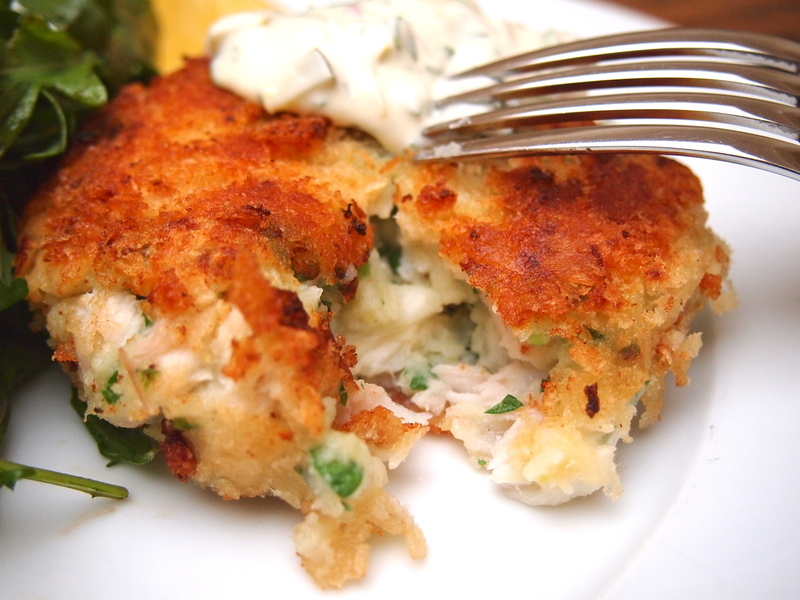 Fish cakes are ideal if you have leftover fish or mashed potatoes and this is indeed how they may have originated – a sort of pescetarian bubble and squeak. But really they’re so good that there’s ample justification in making them from scratch. The good thing is that with the potatoes being incorporated with the fish it’s one less side dish you need to worry about. In fact all that’s required to go along side is a green salad or some steamed peas. 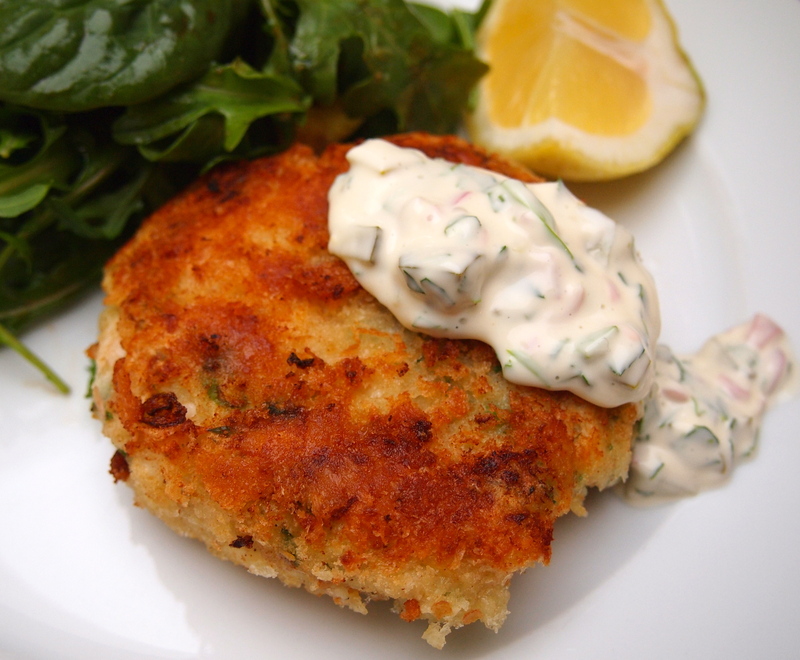 I do love however topping the fish cakes with this easy home-made tartar sauce which gives a welcome tang and bite. To make the tartar sauce place all the ingredients into a bowl and mix well to combine. Taste and adjust seasoning with more, salt, lemon juice or white wine vinegar. To make the fish cakes bring the milk, bay leaves, peppercorns and salt to a boil. Lower heat to a gentle simmer and add the fish. Cover and cook for 10 minutes, or until the fish is just cooked. 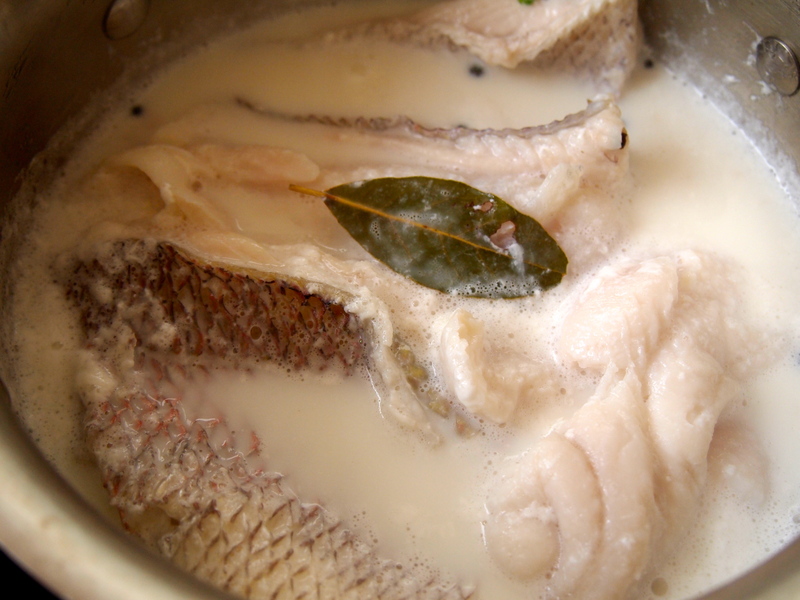 Remove the fish from the milk and leave to cool. Once the fish is cool enough to handle remove the skin and gently flake the fillets into large bite size chunks, set aside. 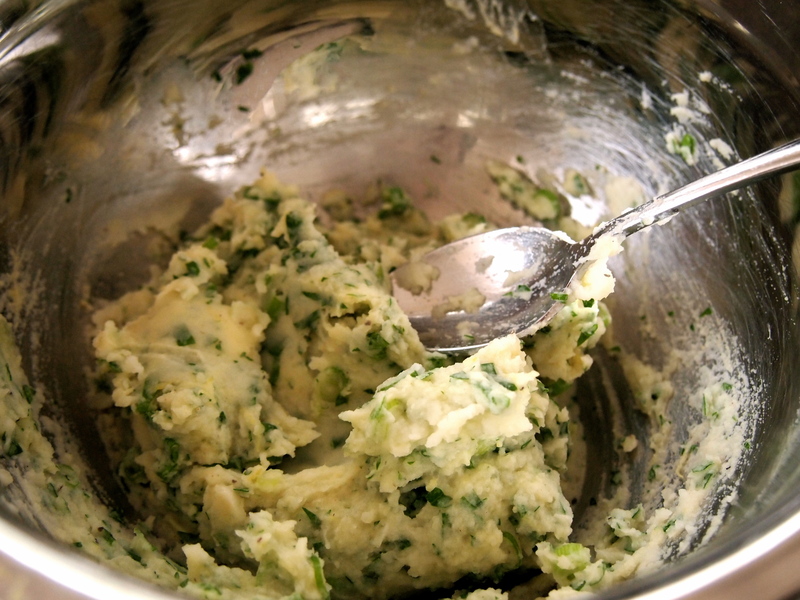 Put the mashed potatoes, spring onions, lemon zest, parsley, dijon mustard, 1 teaspoon salt and a generous pinch of black pepper in a bowl and mix until well combined. Taste and make sure it’s seasoned well. 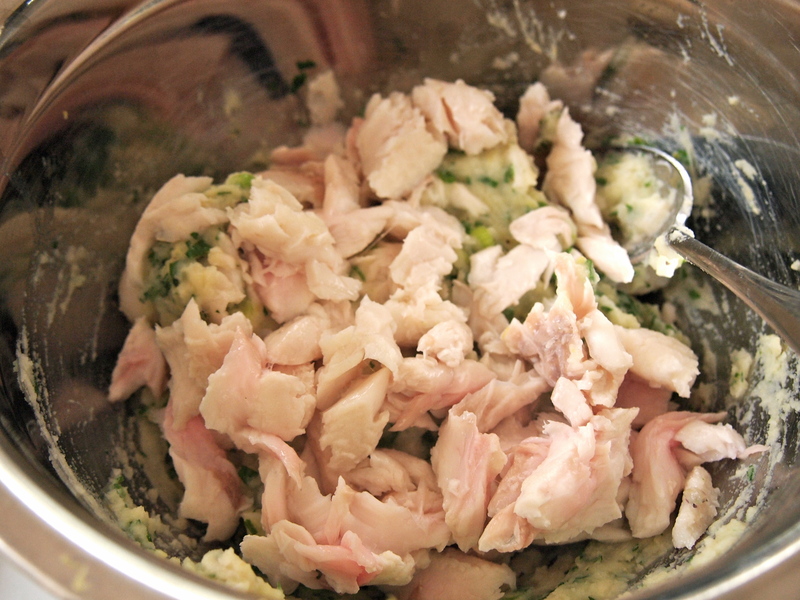 Add ¼ of the fish and beat it firmly into the potato mixture. Add the rest of the fish and this time very lightly and gently work it through so as the flakes remain as whole as possible. Place the mixture in the fridge for 10 minutes to firm up. With slightly dampened hands take a handful of the mixture and form it into a thick patty. The size should be roughly 10cm in diameter and about 2 cm thick, but you can of course make them smaller if you wish. Repeat with the remaining mixture. You should end up with 5-6 cakes. Bread the cakes by placing each fish cake first into the flour, then the milk and lastly in the mixture of plain and fresh breadcrumbs which have been mixed together. 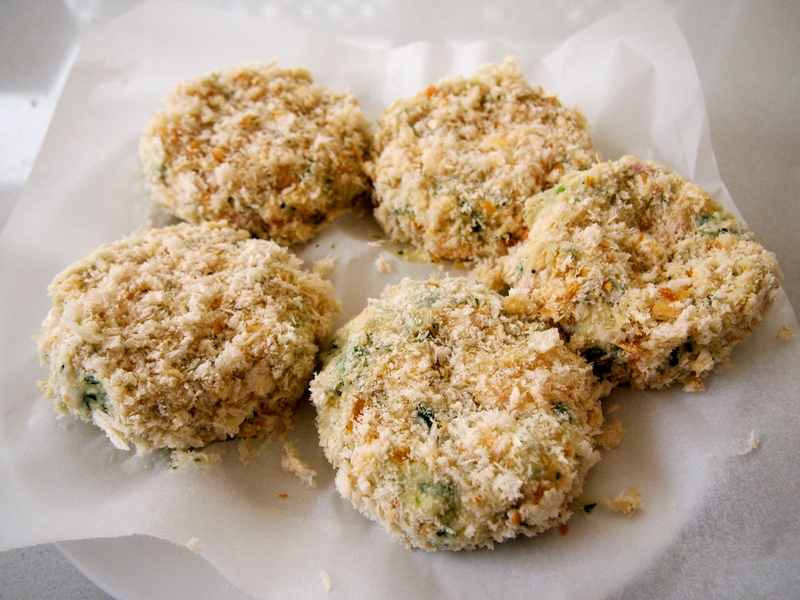 The fish cakes can be prepared up to this stage in advance and refrigerated until ready to fry. 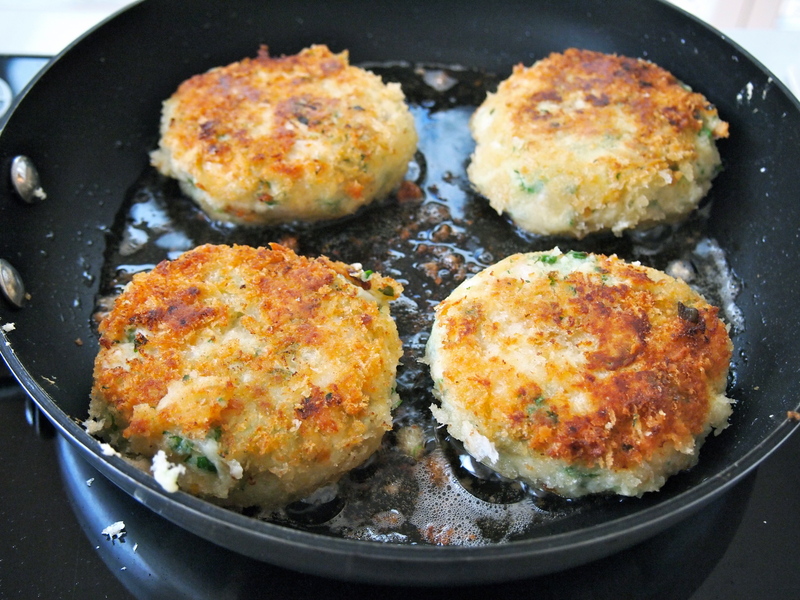 Bring the fish cakes back to room temperature and heat a large non stick frying pan over medium heat. Add the butter and oil and when hot place the fish cakes gently in the pan. Let them cook undisturbed for a few minutes, make sure though that the heat isn’t too fierce. Check the underside of the cakes and if they are golden brown turn them over. Cook the other side for another few minutes until also golden. Remove from the pan and let them rest for a couple of minutes before serving with the tartar sauce and some lemon cheeks.